In Japan, Rockman has enjoyed a long history of animated television commercials. 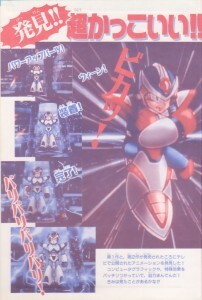 Today I’ll be looking at two such commercials for the Rockman X series that aired in the 90s. Check it out!! An Ultra-Amazing Discovery!! 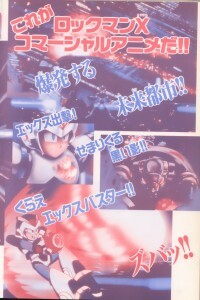 It’s the Rockman X Animated Commercials!! EXPLOSIONS ROCK THE CITY OF THE FUTURE!! DARK SHADOWS ARE CLOSING IN! We’ve uncovered these made for TV animations from around the times when the first and second games came on sale! Using superb computer graphics and special FX, these are completely extraordinary! Did you get to see them!? Thanks to the internet, now we all can. The song from the X2 commercial is “Sekai ga Owaru Toki” from REDIEAN;MODE. The X1 commercial’s background track was laid down by Capcom’s own Alph Lyla, but sadly I don’t think it’s available by itself anywhere. I really like the animations for these commercials. They have such a tremendously dark, futuristic feel that’s parallel but almost outside the atmosphere of the games themselves. It’s almost an exaggerated sense of everything: X downing that giant flying battleship in one shot, for instance. Or using the Item Tracer to search out his prey, Wheel Alligates. Things you can’t really do in the game, but are pretty awesome regardless. And how about that wonderfully creepy depiction of Armor Armarge, that still gives me the chills! 6 Comments to "X, Commercialized." haha, I definitely remember those gifs! Dang I wish I could find one again, they used to be everywhere! Too bad about the first commercial’s music. At least the later X game’s music sounds like it! I think I’ve seen those .GIFs before–or maybe I’m remembering wrong and they were made from X4. *whistles* Dang those look sweet. Why was I so late in joining the Rock Man fandom? I’ve missed way to much stuff out there. I think X3 and Xtreme 1 are the only ones in the X series that DIDNT have an animated TV ad. And X4’s was pretty lackluster, merely using some of the in game cutscenes and Zero voice clips. I always love those two. they are so awesome. especially that EEKSSS at the beginning of both. 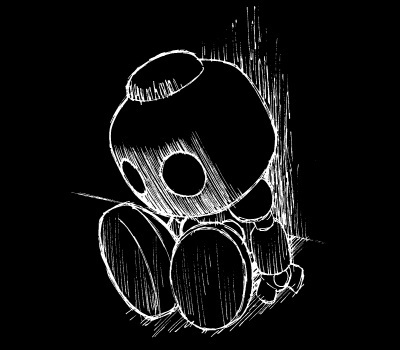 Man…….. I know I have those gifs SOMEWHERE…………. I have too look at one of my old towers, maybe it’s on there. Classic stuff of course……… man I miss the old fandom back on IRC…….. I finally found a few sites with ’em!